Read all news items about the AGE Reader, Diab-spot and DiagnOptics. Groningen, the Netherlands – February 12, 2016. Diagnoptics has received market approval from the Chinese Food and Drug Administration (CFDA) for the AGE Reader SU. This allows the Chinese distributor of the AGE Reader, Costrength Science&Technology Development Co, LTD., to market the AGE Reader SU in China. After extensive tests, the CFDA approved the marketing of the AGE Reader in China to measure tissue accumulation of Advanced Glycation Endproducts (AGEs) by means of fluorescence techniques (skin autofluorescence). AGEs are known to play a key role in the pathogenesis of many age-related diseases, such as diabetes, cardiovascular disease and renal failure. The AGE Reader has been proven in clinical studies to provide an immediate cardiovascular risk prediction for major chronic diseases, such as diabetes, cardiovascular disease and renal failure. The method is convenient, easy to use and validated in many international studies. 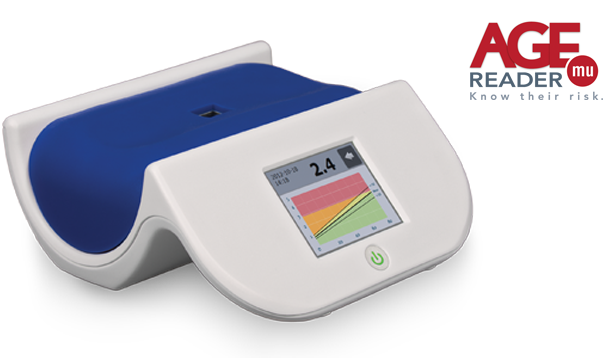 Diagnoptics was the first company worldwide to introduce a technology to non-invasively measure the tissue accumulation of AGEs by means of fluorescence techniques (AGE Reader). The AGE Reader has been used in clinical practice and research since 2006. Since the introduction of the AGE Reader over 150 peer reviewed scientific papers have been published. By now thousands of healthcare professionals use the AGE Reader every day. If you want to receive the newsletter with information about DiagnOptics' products, please send us your email address.